Illustrations of Boya playing qin for Ziqi (based on a story discussed further here) have been quite popular throughout history. These come in a variety of settings. For example, at bottom is one showing a landscape setting.4 What is striking about the tableau of Confucius with Shi Xiang is how similar it is to the above. 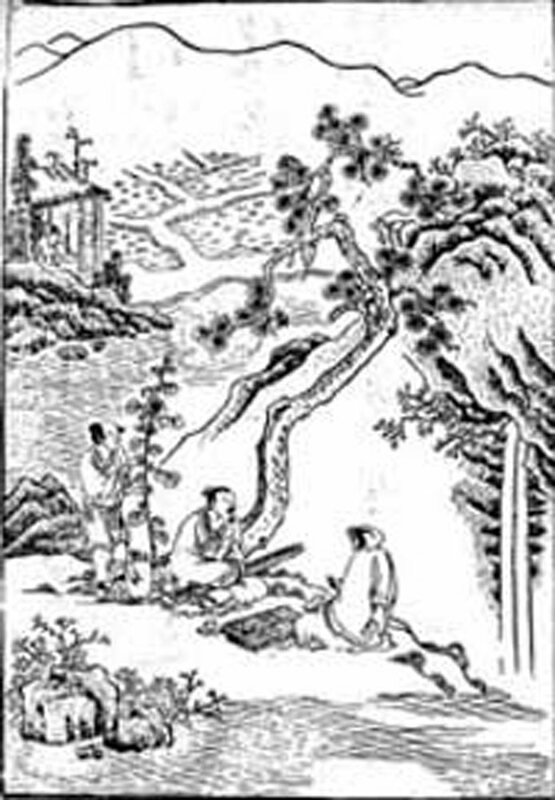 The title for the painting above is 伯牙鼓琴圖 Boya Plays the Qin. The original (full scroll), by 王振鵬 Wang Zhenpeng (1280 - ca. 1329; further info), is in the Palace Museum, Beijing. It was taken from one of the many online copies, but these URLS keep changing so I have now put copies on the present site. 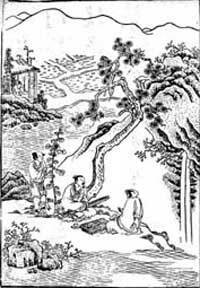 Some accounts do make Zhong Ziqi out to be a scholar, but he is traditionally said to have been a woodcutter / fuel-gatherer. The literati tradition often depicts fishermen and woodcutters as having knowledge through living a natural life rather than through book learning (see, e.g., under the introduction to the melody Dialogue between a Fisherman and a Woodcutter). This image is a closeup of part of an illustration (untitled but with commentary) in the back of 孔子聖蹟圖 Sagely Relics of Confucius, an illustrated book of the life of Confucius originally published ca. 1930 but copying old images. 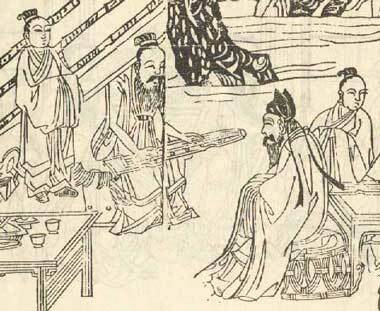 Earlier in the book is this main illustration, "學琴師襄 Studying qin with Shi Xiang"; it has somewhat different surroundings but Confucius and Shi Xiang are in a similar relationship. Boya and Ziqi, as well as Shi Xiang, are mentioned in the Shi Ji; otherwise they are largely mythological figures. In addition, there is no information on the style of the "qin" in Confucius' time. Thus the question is not which of the incidents came first (if they occurred at all), but which depiction came first. Illustrations from the life of Confucius are said to date from perhaps as early as the Song dynasty, but existing woodblocks survive only from later dates. It would be interesting to find commentary on the similarity of these images. In particular, is it possible that images of Confucius playing for Shi Xiangzi, though now rare, pre-date those of Boya playing for Ziqi? This one seems rather old, or at least is in an old style. An internet image search for 伯牙子期 (with or without quotes) will yield a great many modern depictions. Copied from the now defunct website of the 鎌倉琴社 Kamakura Qin Society; no details on the original.